"I get by with little help from my friends..."
Not sure what's his story and how he got Katie Grand to pull off this casting and use Marc Jacobs' store as the venue, but it's certainly not deserved. This embarrassingly awful, childish even. It's great to support new designers but next time let's pick one who can present a decent collection. Same materials and same technique for the whole collection that contains most of the ugliest dressess of the season. I agree, so not deserved. bonnevie and jeanclaude like this. You know Marc Jacobs is obsessed with Rupaul’s Drag Race when he brings this sheet to New York. I happen to think that some of these are fabulous and bring an energy to NYFW that has been missing for a while, but it always rubs me the wrong way when someone gets this big of a production - Marc Jacobs' store as the venue, Katie Grand throwing all Miu Miu girls in the mix - for their debut show. It's like they're telling the viewer to pay attention ("Look, he got Bella to walk his first show, must be the next big thing!") instead of the viewer realizing that from the designer's work. It's like Richard Quinn having the Queen front row; it automatically put me off, I don't know why. AnaD, Cecilou and GivenchyAddict like this. Marc Jacobs' store, Miu Miu's casting and Katie Grand's signature might help you create hype around your name but it will not last long if you don't create an identity and personal vision to support them. Lol no! 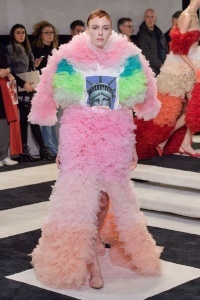 We don't need a Giambattista Valli-Molly Goddard for NYFW! kenndale and jeanclaude like this. Also, as Mary Katrantzou and other designers known for one technique or specific style told us, it’s better not to praise someone so fast... The disappointment will be hard! So, i’m Not buying any of this. jeanclaude and Ives927 like this. It's a pity the execution turned out so poorly because the show was hyped beyond belief as such I wanted it to succeed. I do agree with Dodencebt that overall it's really rejuvenating for NYFW. For most of the other brands, it's business as usual as they try to actually sell pieces as oppose to just parade them down a runway. That's a luxury they're sadly not afforded. So here we have what was supposed to be unbridled, and not necessarily wearable fashion. Doesn't appeal to me at all. It's very tricky to take on voluminous pieces, to begin with. Ask Viktor & Rolf or Valli. Most of the times it just ends up being blobs of whatever. 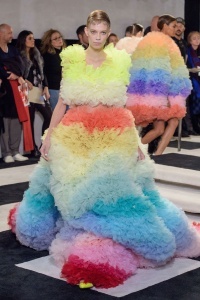 But then this designer then proceeded to lay on garishly technicolour madness AND defined elements like slits and tulle. I was never going to work. And least it kinda, sorta looks interesting. So the designer is originally a costumer, so most of these looks will end up on the stage or on red carpets anyway, so it's not as if the average consumer will be looking to snap these looks up. Would the average customer want to wear these outfits, no. But specific buyers would, and it's a smart move to premiere in a new country with a bang at the beginning of the most popular fashion week. His name certainly got out there, and I'm sure stars and buyers who have never seen his work before are definitely taking note now. Gaga already owns some pieces, but I can totally see Tracee Ellis Ross, or Janelle Monae picking up some now too. I like how invigorating the coverage for this show was, and how much fun the attendees and the ideal seemed to be having at the show. Such a change to how NYFW usually kicks off.